Pistorius Walks Without His Prosthetic Legs In Dramatic Show At Sentencing Hearing : The Two-Way A defense lawyer called the track star a "broken man" and said Pistorius has made a "series of enemies" since he killed his girlfriend in 2013. The athlete faces a minimum of 15 years for murder. Oscar Pistorius walks without his prosthetic legs Wednesday during his resentencing hearing at the Pretoria High Court for the 2013 murder of his girlfriend, Reeva Steenkamp. Oscar Pistorius reached out a hand to steady himself as he walked across the South African High Court room on the stumps of his amputated legs. Lawyers for the former track star, nicknamed "blade runner" for his speed and double-prostheses, are trying to demonstrate that Pistorius is severely disabled and deserves a more lenient murder sentence than the 15-year minimum term for killing his girlfriend, Reeva Steenkamp, on Valentine's Day 2013. Under South Africa's sentencing rules, minimum sentences can be reduced under special circumstances, at the discretion of the judge. Pistorius, who sobbed during Wednesday's hearing, was acquitted of murder but convicted of culpable homicide in 2014 for shooting Steenkamp multiple times through a bathroom door. Prosecutors appealed the conviction, and an appeals court found him guilty of murder. Pistorius appealed and was denied earlier this year. He was released on bail last year, and has been living under house arrest while he awaits sentencing. In the sentencing hearings this week, defense lawyer Barry Roux has focused on his client's mobility and fame. On Wednesday, he called Pistorius a "broken man," and said Pistorius is not the "strong, ambitious" person he is perceived to be. He also said the Olympic runner has made a "series of enemies" over the course of his legal saga. "It was not the man winning gold medals that must be judged," Roux said in his closing arguments. 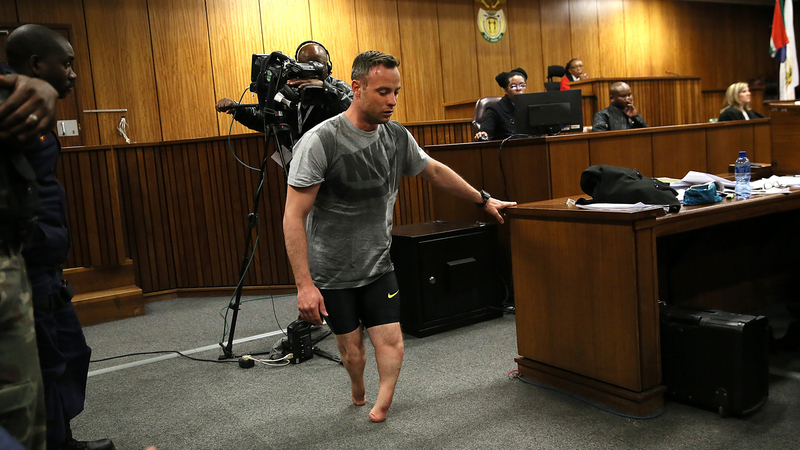 He pointed out that without his prosthetics, Pistorius is much shorter than his 6-foot frame with them. A clinical psychologist, Jonathan Scholtz, testified that Pistorius suffers from both depression and post-traumatic stress disorder. Chief prosecutor Gerrie Nel pointed out on cross-examination that although Pistorius said he could not testify at the hearing because of psychological problems, he did recently give a TV interview. According to The Associated Press, the courtroom in Pretoria was packed with both Pistorius' and Steenkamp's family members. The sentencing judge, Thokozile Masipa, is the same one who originally acquitted Pistorius of murder. Sentencing hearings are scheduled to continue through Friday, and the judge is expected to make her decision in early July.